This search bar does work! Type your email, then a copy of my post will be delivered to you whenever I publish. Real Gift via Facebook; Web 3.0? My Myanmar friends from U.S are rarely active on Facebook. 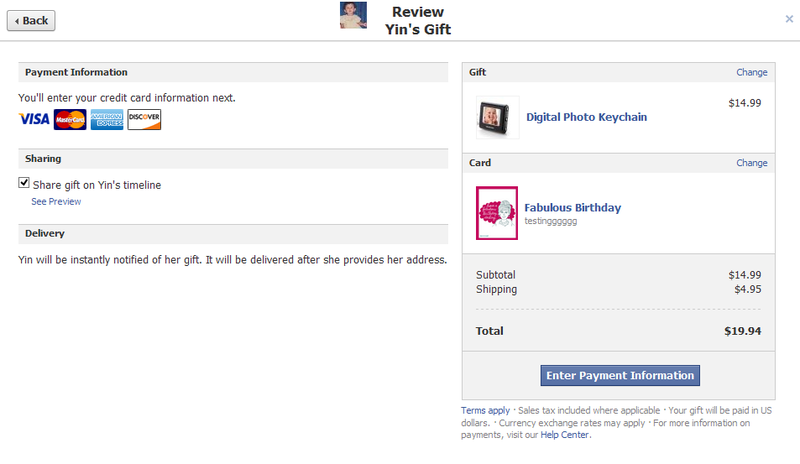 So, I browsed on of my BFFs wall few minutes ago and it notified me that I can now send real gift via Facebook to those in U.S!! 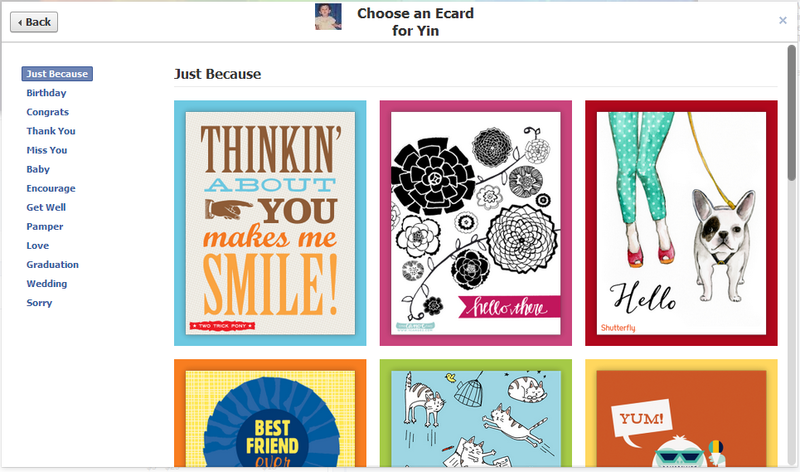 You can even choose occasion, gift cards, write your own message and pay for it. There are many inexpensive items. And privacy? It seems safe since only when the recepient provided their address, it will be sent! Add a virtual gift card and sweet words. Lately, I do not really say Happy Birthday on Facebook to those who are not close friends of mine. Not only because I think it’s useless but also I like to make my friends believe that I do feel like wishing in person by doing so only to certain people in my friend list. But I sometimes feel like I could send something physical to them – be it a little card or something just to make them realize I do remember their birthdays from bottom of my heart. But I don’t think someone would bother to actully buy something even via online shopping and prepare to send it to them just because it takes time and boring. 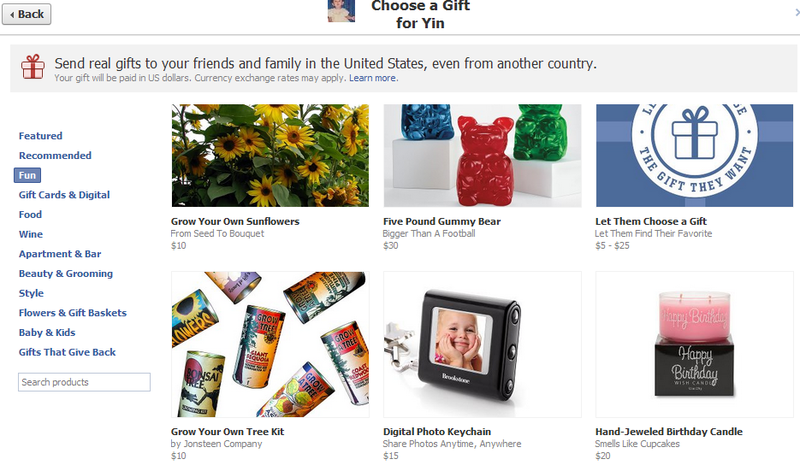 But then again, now that Facebook comes out with such thing, I would definitely buy small things on my friend birthday. I need to click only about 5 times and viola, your gift will be sent to their doors! With only about 10 bucks, you can pass your love virtually that will be transformed into something tangible to your loved ones. I mean, what a cool way! Some people take Facebook too seriously. In Myanmar, it’s almost a ground for propagandists. (Okay, I’ll leave this out in such a fun post.) But for me, Facebook basically should be a fun place to be connected with your loved ones. Let’s say you have crash on someone. *wink* He/she and you are friends on Facebook but you like to take a step forward. Then, this option will be perfect! If you want to make him/her suprised more, you can do so from another Facebook account that does not reveal your real identity. (But that would only work if your crush is eager to take risk of accepting a gift from an anonymous. For me, I would accept since the gifts are legal ones and you can’t prepare your own to send me something nasty) It could be a new way of starting a relationship – a hybrid version of online and offline. You went to a business related dinner and want to say “Thank you” to whoever had invited you. Instead of just posting “Thanks for tonight!! !” on their wall, why can’t we send them a nice small gift with “thank you” message. They would definitely recognize you among those who came to dinner!